Bubbles provide oxygen to your tank ecosystem. They live underwater, but fish breathe oxygen and expel carbon dioxide just like you do. Without aeration, oxygen doesn't get into their water, and carbon dioxide doesn't get out. But the fact is, deliberate increase of aeration is necessary only sometimes. Aeration is the introduction of oxygen into your aquarium ecosystem. It occurs naturally at water's surface -- so the more surface area your aquarium has the more natural aeration it will have. A long, wide tank aerates naturally better than a tall, narrow tank with the same volume. A tank filter system also provides aeration, as do devices that disturb the surface of the water, like fountains. 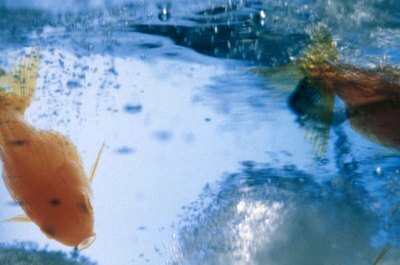 Other fixtures, such as air stones, bubble wands, bubble disks and power heads add oxygen and circulate the tank water. Circulation is an important part of aeration because it moves water from the bottom to the surface to pick up oxygen and release carbon dioxide. It's hard to overstate the importance of aeration, since the biggest benefit is that it keeps your little swimmers, invertebrates, corals and plants alive. It also helps keep your water chemistry stable, promoting a thriving aquatic community. Aeration encourages the growth of aerobic bacteria that consume ammonia, nitrate, phosphate and other compounds that must be kept in check. This limits the opportunity for algae blooms, too, since algae eat the same stuff. Too little aeration means your underwater friends don't get enough oxygen. If your fish are hanging out right at the surface, perhaps even gasping, your tank is under-aerated. It's especially telling when bottom-dwellers keep heading upstairs uncharacteristically. Your fishies might also spend an inordinate amount of time right around the filter, where water is being churned and aerated. In such cases, add an aerating device to your tank. The warmer your water the more aeration the ecosystem needs. If it's warmer than 80 degrees Fahrenheit, you almost always need something specifically designed to aerate. Overcrowding and medicating the tank can also reduce water's oxygenation. Although aeration is a necessary and good thing for your watery ecosystem, that doesn't mean you should just load the tank up with devices that increase it. It's possible to have too much aeration in your aquarium. This can quickly take a toll on your plant life, and it's a threat to your critters, as well. Too much oxygenation can even cause a potentially fatal condition in your fish called gas bubble disease. Affected fish develop bubbles in their skin and around their eyes. Too much circulation -- most obvious when your little swimmers struggle to swim straight or they get whisked around the tank -- there's probably too much aeration going on. Turn down or downgrade your filter.